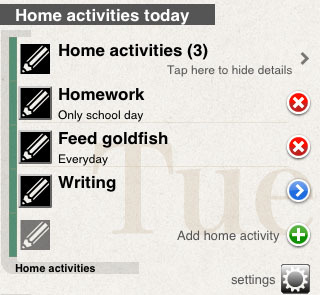 'Pupil Life Manager' is a toolbox for parents, who want to take advantage of iPhones in order to manage their children's elementary-school life and home activities. Originally, this app was developed for myself, a parent of a girl living in JAPAN. So, the 'elementary school' here implicitly implies the Japanese elementary school. The overview of the features of this app shown in this page may help you find whether this app is suitable for your children's life style. A calendar shows various icons, which represent school events, home activities, and children's daily achievements. Gray icons indicate that registered information is as scheduled, and black icons indicate irregular/rescheduled information. Colorful icons show children's daily achievements in their home activity. These icons are linked with a 'Check Table' (see below). Tap a gear icon to change display settings. This App can store data of multiple children. Tap an icon to the upper-right conner to register data of another child, or edit existing data (name and birthday). The up-and-down arrows icon can switch among data of registered children. Note: The calendar does not show national holidays (except for Japanese). Tap a row of a day in the calendar to confirm detailed information of that day. The detail view consists of nine sections. Each section shows the following information. In this section, you can confirm the time your children goes to school and comes back home. A time table is used to register your children's weekly schedule. To show the time table, tap a gear icon in this section. A new time table shows that a child goes to school from monday to friday at 7:00 and comes back home at 15:00. Modify this default time table so that it reflects a child's actual schedule. 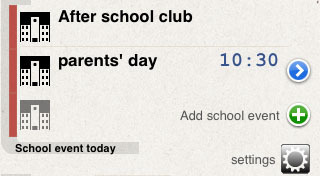 In this App, school events are categorized into two groups: 1) those repeated every weak, and 2) irregular events, each of which is held on a particular day. To register weekly events, tap a gear icon. Then, a weekly schedule table is shown. 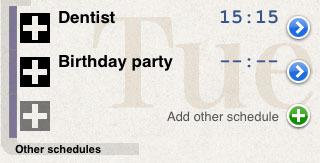 Although you can include time information for each event, a notification functionality for school events are not implemented. 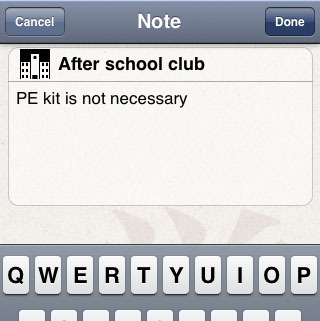 Tap the row saying 'Add school event' to register an irregularly held school event. Details of the registered event can be modified by tapping the blue circle to the right. You may also register additional information for each event. To do so, tap a row for each event. Note: You may also write note for items in other sections by tapping each row. 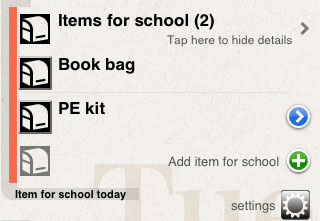 This section initially shows only a single row indicating the number of items for school. This is a header row. Tapping this header row will show details, and tapping the row again will hide the details. Items for school are categorized into three groups: 1) everyday items, 2) weekly items, and 3) irregularly required items. The everyday items and weekly items are registered to a schedule table, which is shown by tapping a gear icon in this section. Tap the row saying 'Add item for school' to register an irregular item. You can put a checkmark for each item by tapping a schoolbag icon to the left. You can switch among the data of children by tapping the up-and-down arrow icon to the upper-right of the view. So, after checking a child's items for school, tap the up-and-down arrow icon to show the schedule of another child, and check her/his items for school! Your children might forget to take something important to school. In such a case, tap the blue circle of the row for the forgotten item. A 'Forgotten!' button will appear after the time to go to school had been passed. Tapping this button to register the item to the 'Forgotten Items' section. Note: this functionality is only for irregular items for school. You can confirm forgotten items in this section. The items registered in this section is those for which you tapped the 'Forgotten!' button. You can also register forgotten items directly in this section. After the forgotten item has been brought to school later, tap the blue circle to the left. Then, tap the 'Settled' button. The item will be removed from the list. You do not need to go back to the day on which the item had been forgotten in order to tap the 'Settled' button. You can review the list of forgotten items from the detailed view of any day. Tap a gear icon in this section to edit the class schedule table. You can register up to seven classes for each day. Abbreviated class names less than five letters are recommended. Basically, school days are defined as days for which the time to go to school or come back home are defined. While the 'NO-SCHOOL' switch is turned on, everyday are considered as no-school days. However, a day for which irregular information about school life is interpreted as a school day, even when the NO-SCHOOL switch is turned on. For no-school days, the App does not indicate scheduled information and the notification functionalities are disabled. In this section, various tasks that children should perform at home (e.g., homework) are registered. This section initially shows only a row indicating the number of tasks. Tapping the row will reveal details of the tasks, and tapping the row again wil hide the details. Home activities are categorized into four groups: 1) tasks that should be performed on every school day, 2) those performed everyday, 3) those performed weekly, and 4) irregularly imposed tasks. Tap the row saying 'Add home activity' to register a new task. Tap a gear icon to register tasks of other categories. This section shows schedules for cram schools and lessons. 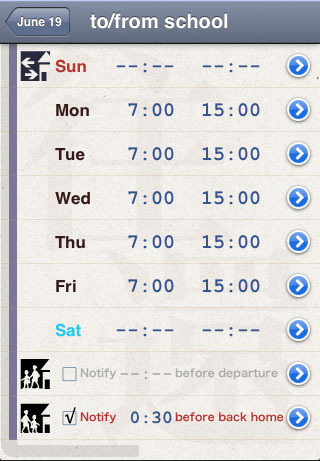 Tap a gear icon in this section to show settings view, in which name of the cram school or lesson, and weekly time schedules are entered. This section can be used to manage any miscellaneous events. Tap a checkmark icon (√) at the bottom of the view to show the Check Table. The Check Table shows tasks that are registered in the Home Activity section. Let your child put a checkmark after a task had been accomplished. Children can choose any favorite checkmark icon from the list shown at the bottom. The Check Table shows the tasks of this day in an order noted below. ・Tasks that should be performed on every school day. ・Irregular tasks for this day. If a task is not necessary to be done on this day, tap a red circle to the right. 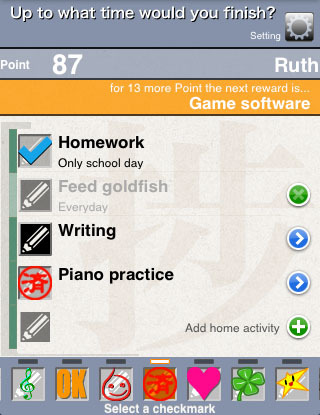 In the example above, a homework and piano practice are accomplished and checkmarks are put on. Writing is not accomplished yet, and feeding goldfish is not necessary on this day. 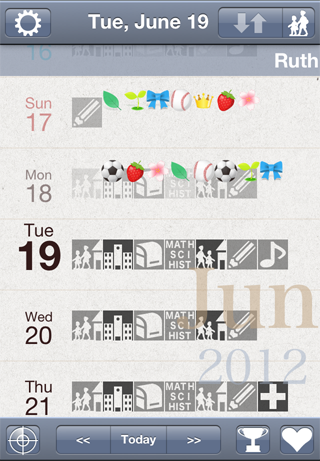 The checkmark icons used in the Check Table are also displayed on the Calendar. Putting a checkmark increases the Home activity point by 1. Up to what time would you finish? You can let your child estimate the time to finish all tasks of the day. After setting the estimated time, a count-down timer is shown in the Check Table view. You can prepare rewords for you children's accomplishment of tasks in home activity. Tap a trophy icon at the bottom of the Calendar view to show the Reward setting view. 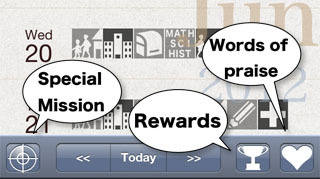 When the acquired Home activity point is equal to (or greater than) the required point assigned for a reward, a message appears to inform that a reward is gotten. 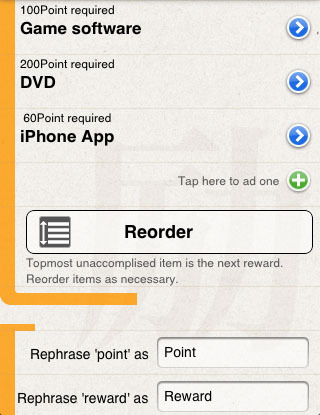 After that, the Home activity point decreases by the reward's required point. The words 'Point' and 'Reward' can be rephrased as necessary. When all tasks of a day are accomplished, words of praise are shown. Tap a heart icon at the bottom of the Calendar view to edit the words of praise. The displayed words are chosen randomly. 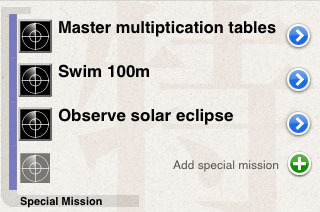 Tap a rader icon to show the Special Mission view. This is another check table. However, this check table is used for tasks that requires relatively a long period of time.